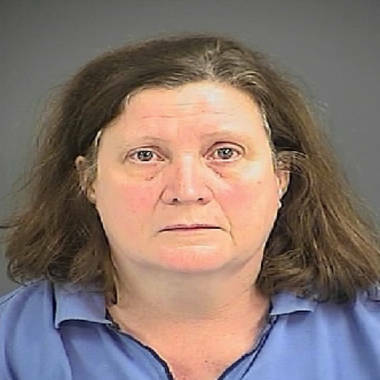 Linda Ruggles is seen in this photo provided by the Charleston County Sheriff's Office on Jan. 5. MOUNT PLEASANT, S.C.- A woman who failed to pay a $480 fine for having a messy yard was sentenced to 10 days in jail, but came home a few days early on Thursday to find an overwhelming amount of support from strangers in her community. Linda Ruggles, a 53-year-old Mount Pleasant, S.C., resident, is a photographer whose business tanked during the recession, The Associated Press reported. She was fined in 2010 after neighbors complained about the debris outside her home. But when Ruggles' story was published earlier this week in the Charleston Post and Courier, she received some help from unexpected sources. Ruggles' problems began in 2008, when plans to repair her home stalled and the economy soured. Unopened packages of shingles have sat on her roof for three years, The Post and Courier reported, and she's been collecting scrap metal and other items in her driveway that she hopes to sell to help pay her bills. The town cited Ruggles for a "clean lot violation" in December 2010 after neighbors complained, saying her mess was driving down their property values. A municipal judge ordered Ruggles to pay the fine or go to jail for 10 days. Officials say she didn’t pay the fine within 90 days and then ignored court appearances and warnings from the town. After a year of trying to resolve the situation, Ruggles was arrested on Jan. 5. "We went well beyond what we were required to do," Police Chief Harry Sewell, who told The Post and Courier he even knocked on her door personally in the hopes of finding a solution, said. "We really did take a compassionate approach." Ruggles told police she couldn't pay the $480 fine because she was using every cent she earned to prevent her home from going into foreclosure. According to The Post and Courier, she has sold blood and even volunteered for medical experiments to keep her home. Six days into her jail sentence, however, she was released. Police told The Post and Courier they shaved a few days off of her sentence. When she came home, Ruggles' messy yard was still there, but many of her problems were about to be alleviated. A contractor said he would shingle her leaky roof. Landscapers offered to clean up the yard. A realty group wanted to help with other home repairs. All for free. Others told The Post and Courier they wanted to help with financial donations. Extreme war stresses to blame in Marine urination video?